The snowy season is upon us! 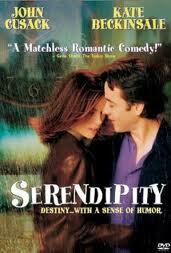 I watched Serendipity two nights ago in an attempt to stave of my desires to watch a full-on Christmas movie. Sigh…. I’m reminded how much I love this movie and have to re-blog the post I wrote about it last year. If you haven’t watched it yet – Courtney – do it! I think it’s even on Netflix now! A movie about gloves. Or most would say romance. What I truly think it’s about is not holding back. Following your heart. Being truthful to yourself. Doing whatever you need to do to avoid “What if…?” in your life. No regrets. Risking losing everything current and comfortable for the sparkle of the ‘if only…’ and then following through even when both the comfortable and the sparkle are lost. Being true to yourself and your own happiness. Passion.